In 2012 we produced only 22 barrels of Highflyer Pinot Noir from Doctor’s Vineyard. The wine was aged for 12 months in 100% French oak, 20% of which were new barrels. This vintage shows bright fruit flavors and the purity of cool climate Pinot Noir aromatics, with tiers of concentrated young cherry, cola, raspberry jam and red plum. Fleshy and full-bodied, the finish is lingering and delicious! The wine was aged on the lees for 13 months in 30% new French oak and 70% neutral French oak. This great vintage reflects in the wine with rich flavors and elegant acidity with concentrated flavors of red cherry, cola and raspberry jam. Fleshy and full-bodied, the finish is lingering and delicious. The 2012 growing season was ideal due to the mild spring that led to great fruit set, followed by a cool summer and dry fall that allowed the fruit to hang long and ripen. These conditions contributed to slowly developing the flavors of the berries into the perfect intensity. 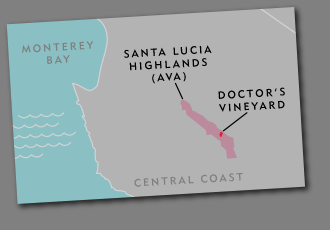 Doctor’s Vineyard is located in the heart of the Santa Lucia Highlands. This remarkably managed property has well-drained soils of sandy loam and gravel. We sourced three clones from three small vineyard blocks to complete our 2009 Pinot Noir blend – each of which was planted between 500 and 900 feet above sea level.